PHOENIX — The U.S. Bureau of Reclamation has allocated more than $4 million to support existing work by western states and tribes to combat the spread of invasive quagga and zebra mussels. Arizona has several quagga mussel-infested waterbodies and will benefit from the increased funding. 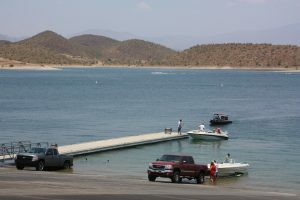 Arizona was among the first western states to have an introduction of the invasive mussels following their 2007 discovery in Lake Mead. Money allocated to Arizona will be used to support existing and future efforts to increase watercraft inspections and decontamination locations throughout the state and to bolster enforcement efforts. Watercraft inspections and decontaminations reduce the risk of spreading quagga mussels and other aquatic invasive species (AIS). Having a seal and receipt documenting a certified inspection can help decrease wait times at inspection locations, and reduce the risk of costly citations or impoundment of watercraft for transporting AIS.